Chelsea went back to the top of the Barclays Premier League with a comfortable win over West Ham at Stamford Bridge. Brazilian defender Alex headed Chelsea in front in the 15th minute but Scott Parker levelled with a stunning volley on the half-hour mark. Didier Drogba rose unmarked to restore Chelsea's lead in the 55th minute before Florent Malouda's 20-yard effort in the 76th minute and Drogba's second put Carlo Ancelotti's side one point clear of Manchester United at the summit. Chelsea goalkeeper Ross Turnbull made his league debut for the club and looked confident enough ahead of Tuesday night's Champions League last-16 return leg against Inter Milan. The keeper, third choice all season, will be asked to play against Inter, who lead 2-1 from the first leg, due to injuries to Petr Cech and Hilario. Chelsea were given a sterner test than they would have wanted by a West Ham side that went in 1-1 at the interval. Ancelotti's side had the better of the early exchanges but West Ham should have been ahead in the 13th minute. Mido's low cross from the byline found Araujo Ilan unmarked just eight yards out but the West Ham striker blazed his effort over the crossbar. 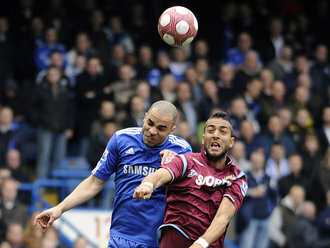 The miss proved costly for West Ham as Chelsea went ahead two minutes later through Brazilian defender Alex. The Hammers failed to clear a corner from Malouda and when the ball was returned to the France winger, his cross was headed home by the unmarked Alex. It was the defender's first goal of the season but it could have been worse for the Hammers seconds later. Another cross from Malouda caused panic in the West Ham defence and a deflection off Matthew Upson looked to be heading for his own net until goalkeeper Robert Green just managed to palm it away to safety. In the 27th minute, Chelsea carved West Ham open again and Frank Lampard's curling cross found Drogba at the far post only for the Ivorian to miss the target. But West Ham were level in the 29th minute when former Chelsea midfielder Parker sent a 25-yard volley over Turnbull and into the top corner. Turnbull could do nothing about Parker's effort but once again Chelsea were guilty of failing to defend a throw-in. The goal stunned Chelsea and their response was predictable and rapid. In the 35th minute, Green had to dive at full-stretch to keep out a 20-yard low drive from Lampard. Two minutes later, Nicolas Anelka tried his luck from 20 yards but the ball was comfortably collected by Green. Malouda was a constant threat to West Ham and five minutes before the break he sent over another dangerous cross but Paulo Ferreira could only direct his header into the arms of Green. Chelsea almost restored their advantage when a 53rd minute cross from Malouda just eluded Michael Ballack at the far post. But the home side were ahead again in the 55th minute and the driving force was captain John Terry. The Chelsea defender surged forward to the edge of West Ham penalty area and allowed Drogba to lay the ball off to Malouda on the left wing. The France winger delivered another pinpoint cross into the six-yard box and this time Drogba headed home from point-blank range for his 26th goal of the season - his 20th in the league. The Chelsea fans began chanting "There's only one England captain" as England coach Fabio Capello watched on from the West stand. Moments later Chelsea were denied a third by a great save from Green who dived to his right to tip away a header from Alex. In the 65th minute, Chelsea midfielder Joe Cole was given a chance to shine before Capello when he replaced Anelka. It was followed moments later by a double substitution for the Hammers - Junior Stanislas replaced Kieron Dyer and Mido made way for Carlton Cole. Malouda made it 3-1 to Chelsea in the 76th minute with a 20-yard shot into the bottom corner. It was a fitting reward for the France winger who had set up both of Chelsea's earlier goals. Chelsea were then denied a fourth in the 85th minute when Lampard's glancing shot hit the far post. Drogba completed the scoring in the 89th minute with his 27th goal of the season - finishing off from close range after Green had palmed a Lampard shot into his path. Chelsea Turnbull, Ivanovic (Zhirkov 80), Alex, Terry,Paulo Ferreira, Ballack, Mikel, Lampard, Anelka (Joe Cole 66),Drogba, Malouda (Kalou 87). Subs Not Used: Taylor, Deco, Sturridge, Bruma. Goals: Alex 16, Drogba 56, Malouda 77, Drogba 90. West Ham Green, Spector, Upson, Gabbidon, Daprela,Ilan (Diamanti 83), Parker, Kovac, Behrami,Dyer (Stanislas 68), Mido (Cole 67). Subs Not Used: Stech, McCarthy, Tomkins, Collison.